In early November, with no warning at all, Parker woke up not feeling like herself. She normally awakens with a breakfast request on the tip of her tongue but on this particular day she quickly snuggled up on the couch instead. An hour later it was apparent that the stomach bug had found us. I grabbed her iPad from high on the office closet shelf and tucked her back in bed with the show Miraculous Ladybug cued up on Netflix and a fresh water bottle next to her bed. To be honest, though, we don’t watch a ton of television around here. We limit it to weekends only, usually while Ever naps and sometimes entire weekends can go by where we unintentionally just leave it off. 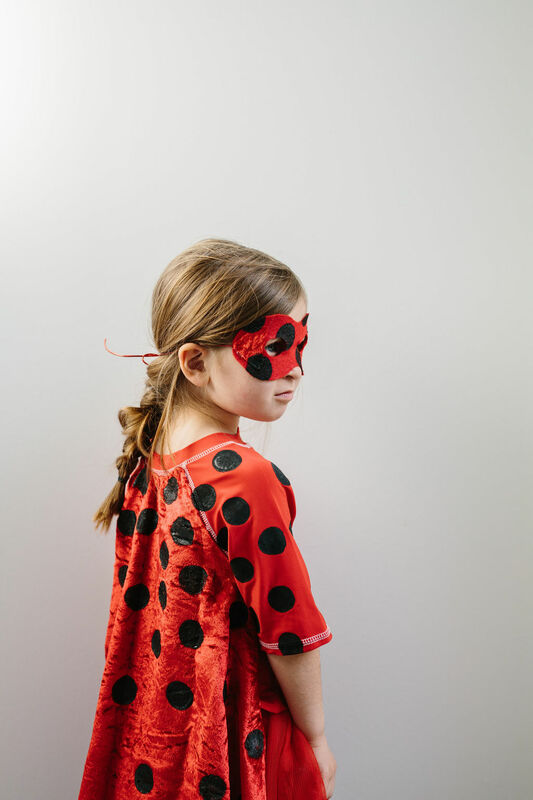 However, I loved how much she loved this ladybug character and wanted to bring it to life for her. 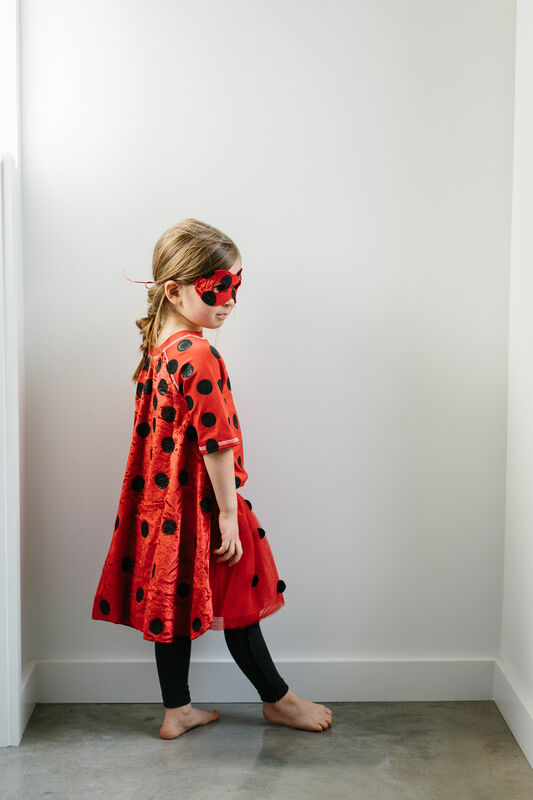 As so many of us are trying to limit screen time in some way, I really love the idea of taking these very dimensional tv characters and allowing kids to bring them to life with their imaginations through costumes. 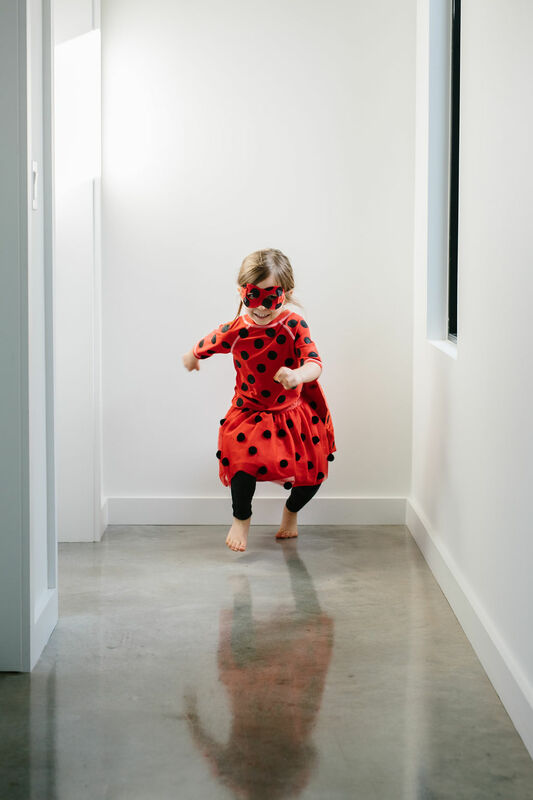 So many of these characters have been written to encompass many traits that we want our kids to possess—team work, kindness, courage, honesty, and resourcefulness, just to name a few. 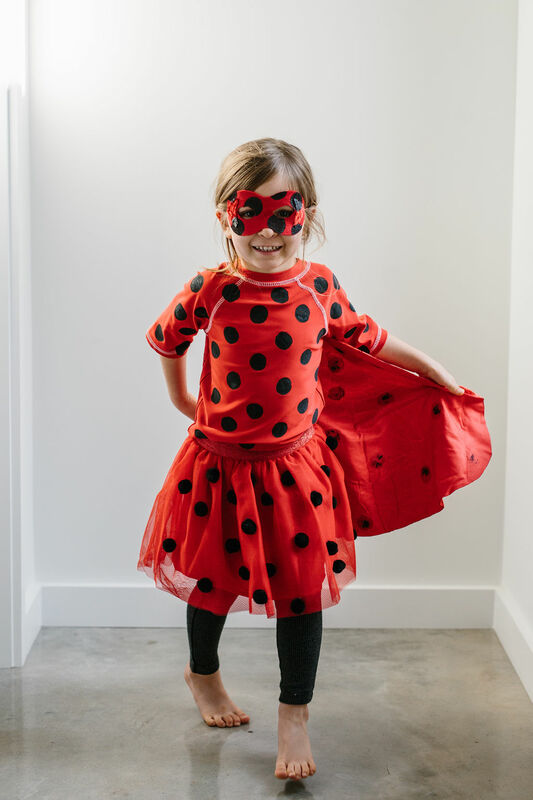 When I showed Parker this ladybug costume DIY, she was giddy with excitement, immediately putting it on and not taking it off all day. It went to school, to the park, out to dinner and was removed only when she knew that it would be promptly washed and could be worn again soon. Line inside of shirt with paper towels or grocery bag and use black paint to sponge spots onto the shirt. Let dry. 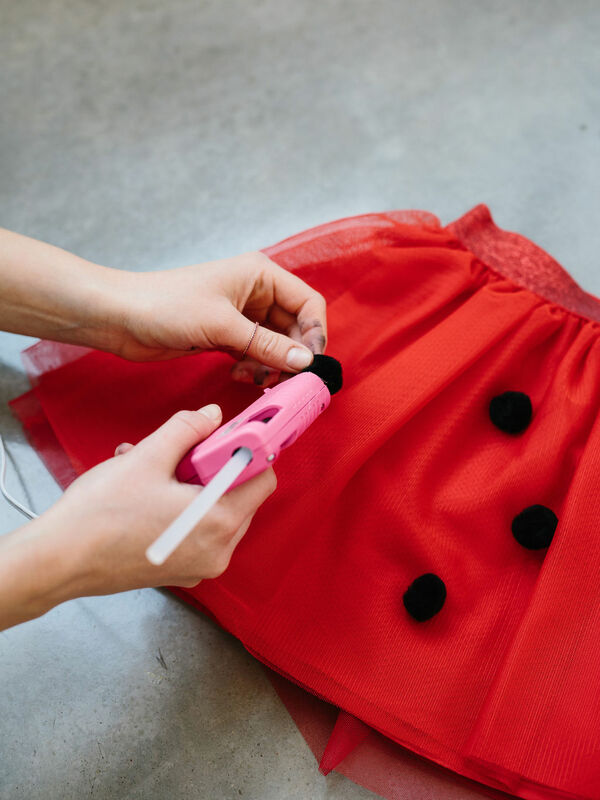 While front of shirt dries, use a hot glue gun to glue pom poms onto tulle skirt. Once front of shirt dries, flip over onto garbage bag or grocery sack. 5. 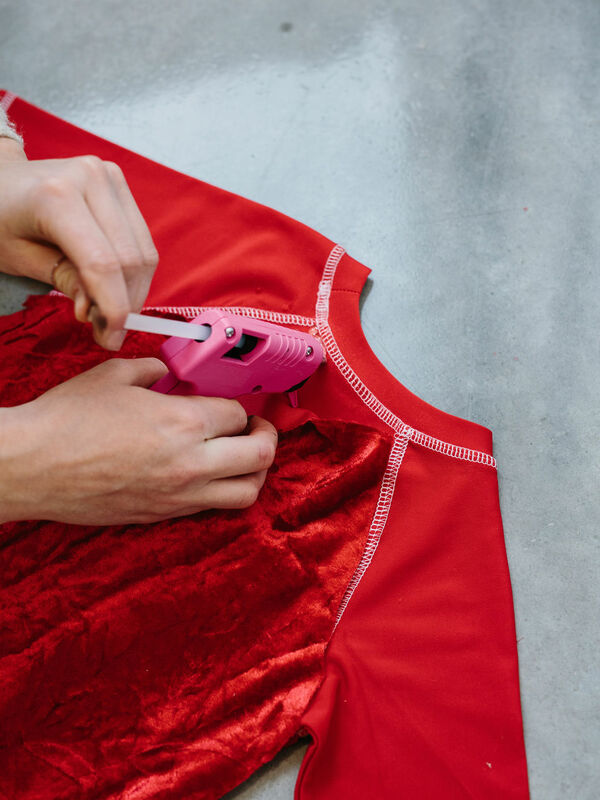 Use glue gun to glue the edges of the cape onto the seams of the shoulders and back. 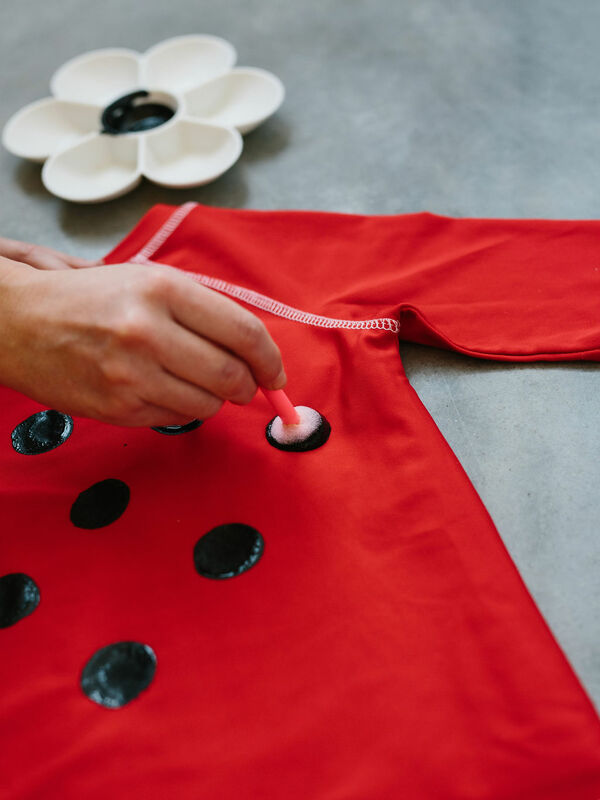 Paint black dots onto the cape and back of sleeves using sponge brush. Let dry. 6. 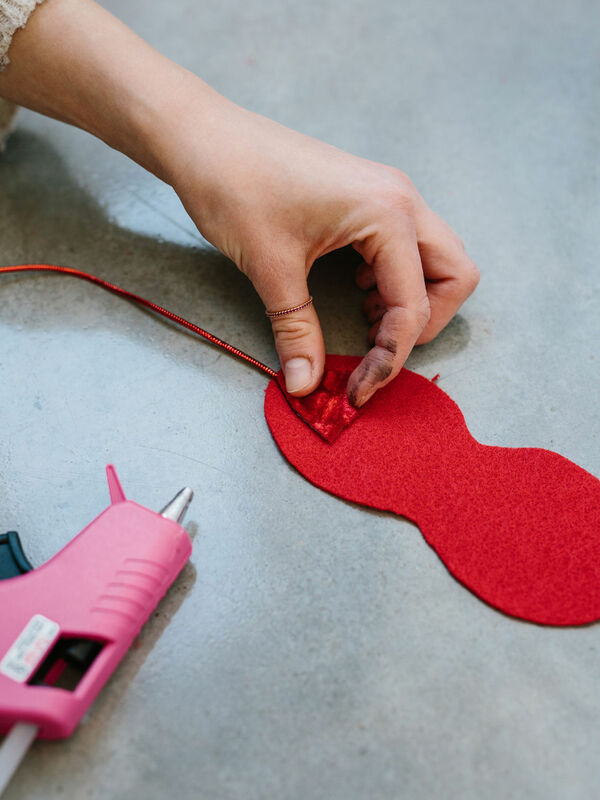 Cut out an eye mask shape using red felt. 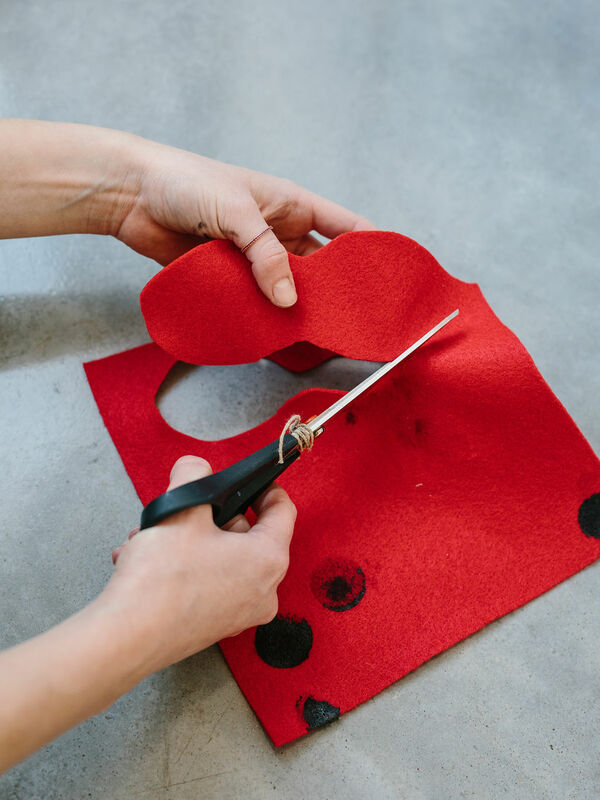 Then cut two triangles out of cape material to glue over red string at corners of mask. 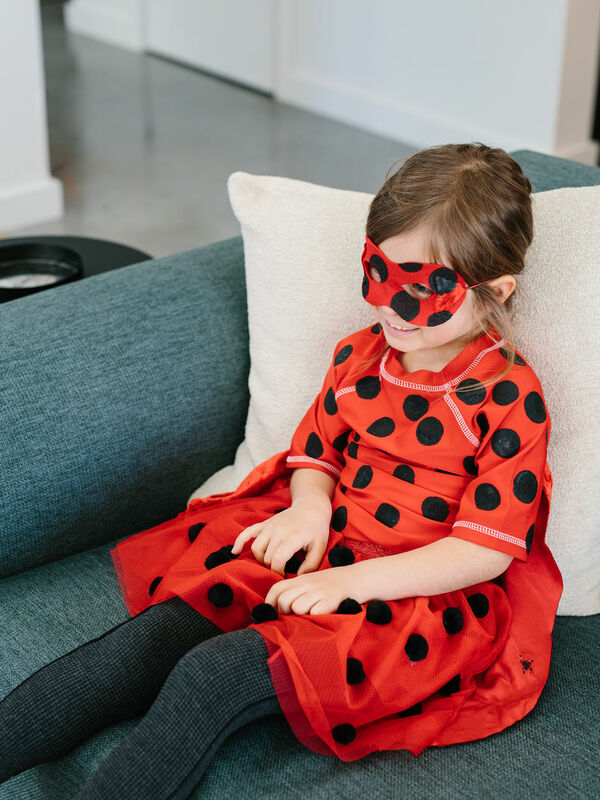 Use the sponge brush to paint black spots onto the mask. 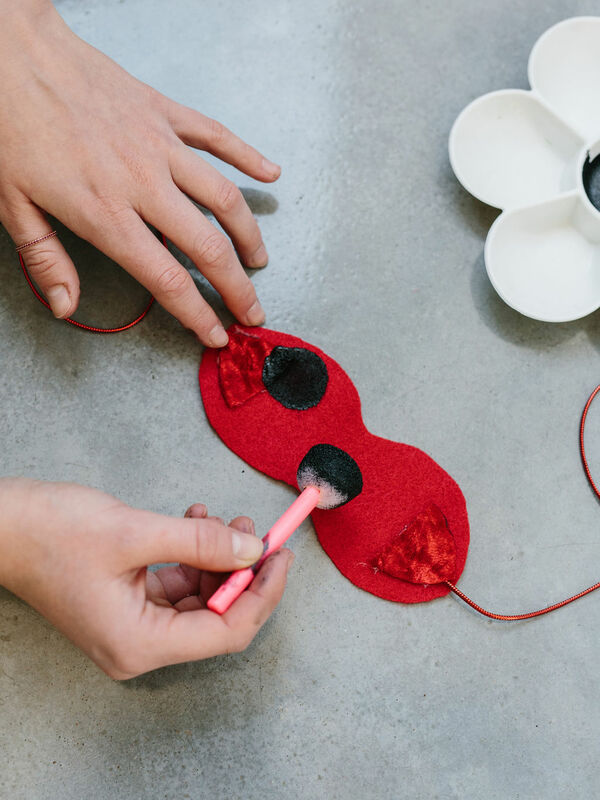 Let dry, then cut out two circles for eyes in the mask. 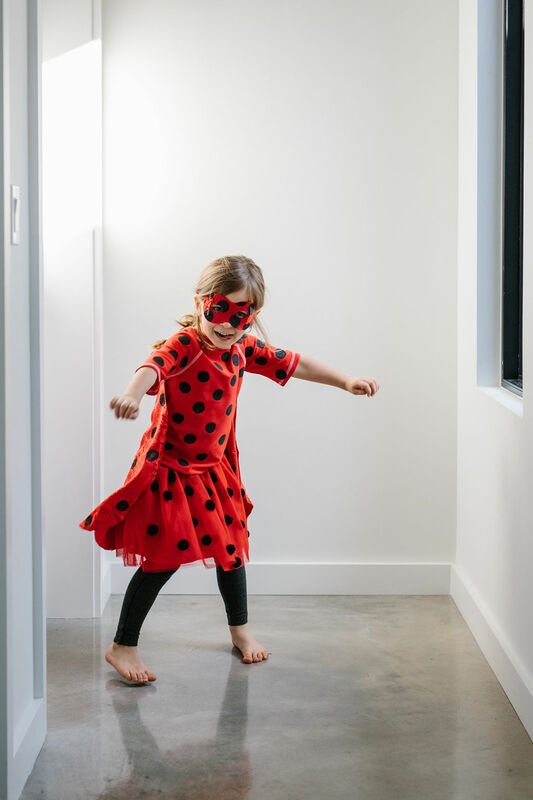 If you haven’t already checked out the show, Miraculous Ladybug for your kiddos, I highly recommend it! PS. 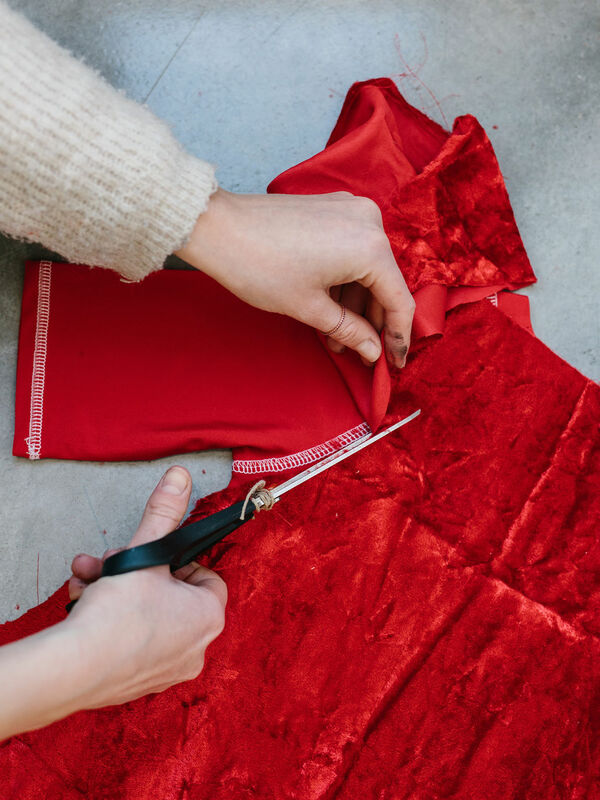 For more DIY costumes, click here! This is so cute!! Not going to lie but I watched some of the French episodes when it first came out to practice my French. It was a cute show. Oh my gosh, Jack loves Miraculous! I’m going to have to show him Parker in this costume! This is the cutest! I just watched the show– is it weird that I even enjoyed it?! Haha! Not at all. I was totally into it!